On Sunday, the 23rdof September, the rain stopped, the skies opened and the sun shone brightly on the 2ndAnnual Swing in the Flowers event hosted by Chrissy and Ray Keepence of Swing On In and Ian Cooke of Prime Flowers. 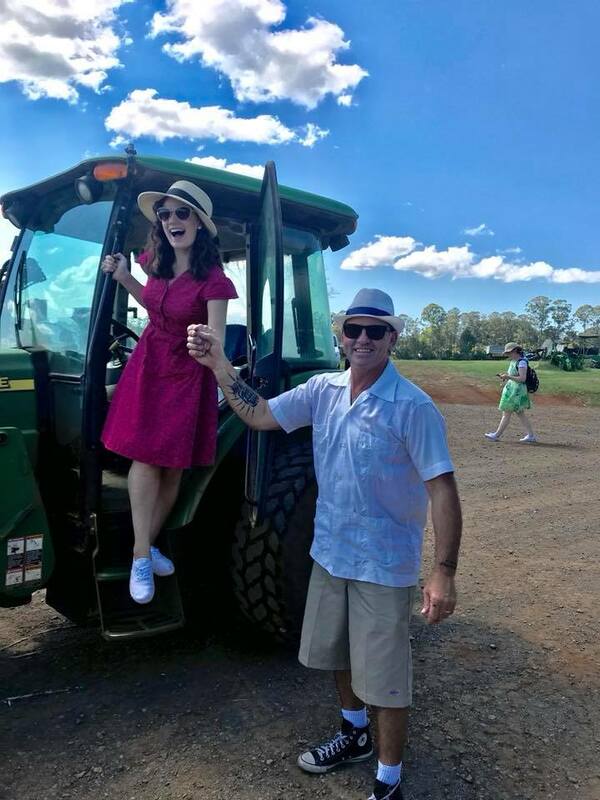 Ian, a long-time dancer at the Bangalow Swing On In Class and owner of the Alstonville-based farm, opened it, for only the second time to the public. The farm, one of the largest producers of flowers in the area, is normally kept under quarantine to ensure the quality of its flowers, macadamia trees, and blueberries. 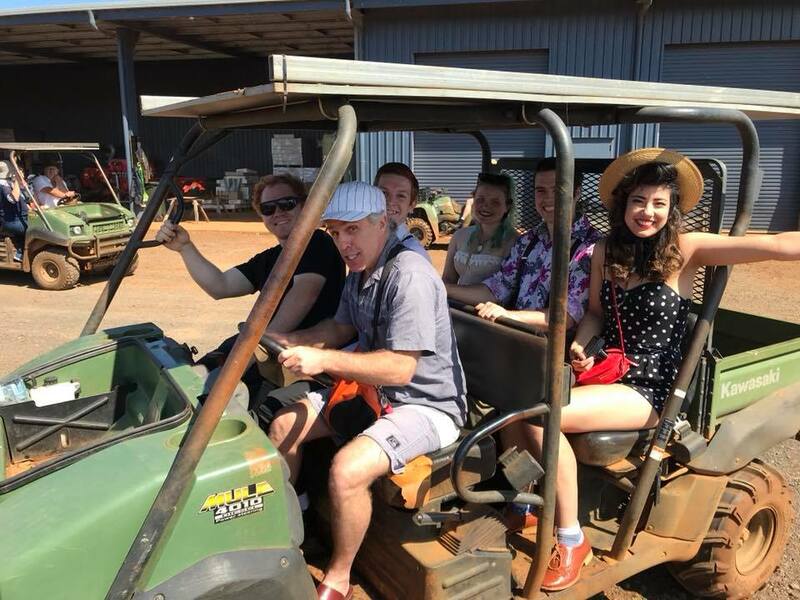 This highly regarded and rare experience to visit Prime Flowers was not only an opportunity to tour the farm and learn about its history, but it was also a chance for the swing dance communities from the Gold Coast and Northern Rivers to unite for a good cause. Over the course of the eight hours together, over 70 enthusiasts raised $800 benefitting the charities Ovarian Cancer of Australia and Beauties Feeling Fabulous. Beauties Feeling Fabulous is a non-profit organisation that pampers women living with or going through treatment for cancer. Founded by Chrissy to honour her sister, the organisation was the brainchild (and wish) of her sister Elisha Neave, who sadly passed of cancer before she was able to see her dream come to life. Chrissy, who also serves as a Community Ambassador for Ovarian Cancer of Australia, knows firsthand what it is like to live with and survive cancer and how a day of pampering can help a woman thrive and regain confidence. Swing in the Flowers was a day jampacked with activities, laughter, comradery, harvesting, tractor rides, flower arranging, dancing, and so much more.The afternoon kicked off with a communal lunch that included yummy rolls and treats to fill them. Waiting for everyone to arrive, people walked around the farm and took advantage of “Farmer Ray’s” tractor rides. Dakota, Chrissy and Ray’s 4 -month-old blue brindle English Staffy, served as quite the farm dog, making sure to get lots of attention from new comers. Each person arrived in style, many of whom dressed the part in timeless outfits and period pieces worthy of a 1940’s afternoon including stylishly big hats, polka dots, suspenders and floral prints. Cameras clicked away as everyone was mesmerized by the gorgeous floral views encountered as they walked around taking in the sweet smells and climbing over all the new and antique tractors. Women on wheels made for quite the show as Chrissy joined Ian (or was swooped away by him) on the back of his motorbike for a ride around the farm. Local sisters, Jazmine and Sheynae, who live just at other edge of the farm, showed up on their bikes to attend the festivities. Before the official tour of the flower processing facility, attendees roamed around the grounds discovering the original farm house which was whimsical and full of surprises such as the random pool table in the kitchen and an incredible, antique, foldout, wooden bar hidden in a back room. Ian gathered everyone to share the history of the area and how he came to own the farm. He talked about the flowers the process from preparing the bulbs to shipping out the gorgeous iris, lilies and other colourful beauties. Afterwards, the group divided. One group continued the tour with Ian and the other group set out to harvest flowers. It was quite a sight to see the buggies race off towards the flowers. Harvesters used secateurs to cut flowers. Then after about 30 minutes, laughter roared up the hill as the buggies turned the corner and returned to the main area with bunches of flowers for everyone to take home. 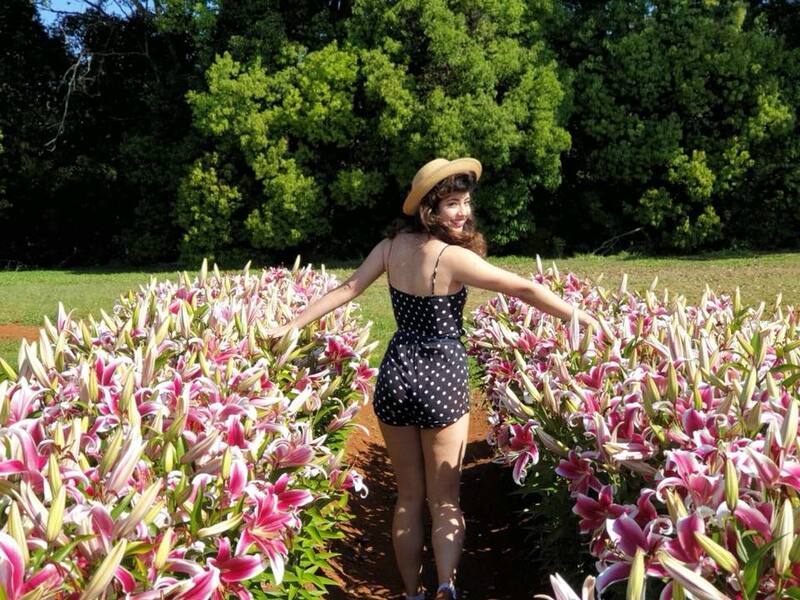 “It was breathtaking to see the lilies all lined up in rows” commented Mel, who looked picture perfect as she was captured standing in front of the flowers in her black and white polka dots and heart-shaped, red purse. Mel also was the second-place winner of the Interactive Flower Arrangement Competition hosted by World Champion Florist, Judith Little. 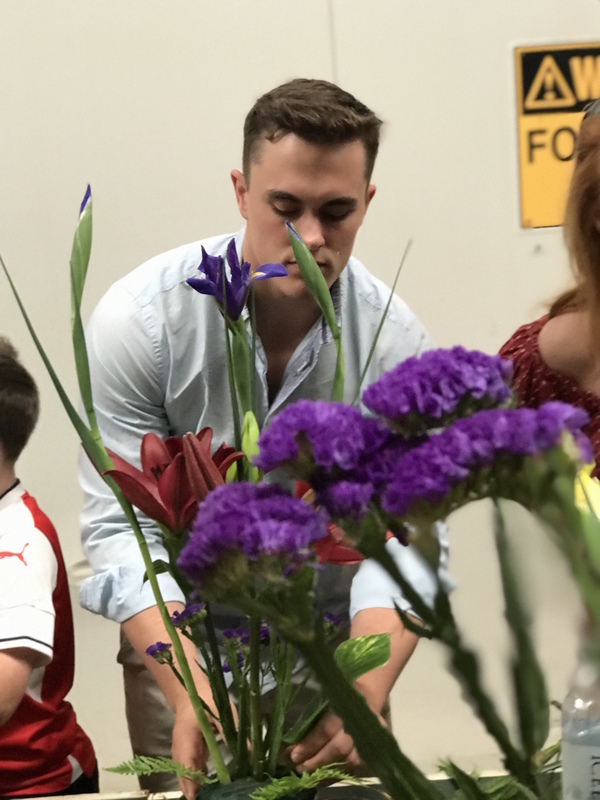 Prior to the competition, Judith captivated the crowd by sharing her talents and explaining the differences between floral arranging and floral designing. Introduced by her very proud husband, Bob, Judith has placed in international competitions and serves as a judge for the Royal Agricultural Society of New South Wales. Judith created two impressive pieces. The floral arrangement was quite large and full of beautiful purples, pinks, and greens with a touch of gold paper to wrap them together. She discussed how over the years she has acquired tools that fit her hands so that she can properly work with the flowers and joked (while she pulled wrapping off flowers with her teeth) that proper tools are important. Her artistic, circular piece was full of texture and intricate design. Once she explained the various elements that make up a great floral piece, she quickly whipped up an example of how to use the materials competitors would find in their boxes. Ten competitors gathered around a converted ping pong table with only a few basic tools and a box that included greenery, green forming wire, lemons, golden decorative wire, and yellow, white or orange lilies. With only ten minutes, each had to come up with a quality design and stage their work to be judged. They were encouraged to “buy” advice from “Judge Judy” by donating money. After the time lapsed, Judith walked around the table commenting on each piece. Comments included positive feedback and refinement recommendations. Chaotic, unique, impressive and unusual were among the words that described the designs. First, second and third place winners each received a prize. At the end of the time with Judith, her floral arrangement was raffled off. Lucky number 62 won the bouquet. With each ticket at $1, the raffle raised $100. Next, everyone jumped in their vehicles and caravanned down to the macadamia trees. Ian explained a bit about the trees and brought out salted macadamias to munch on while walking under the arches and collecting as many nuts as possible. It was just a quick stop but a magical one with more laughter bouncing off the trees as kids and adults alike ran through each row. After the macadamia trees, the troops caravanned even further down to the netted rows of blueberries. 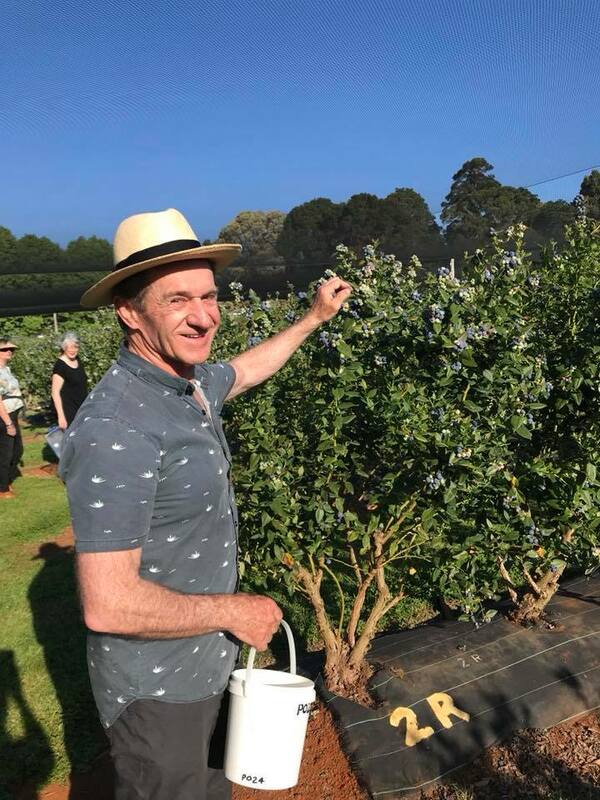 Everyone collected and ate as many blueberries as they could hold in whatever they had – from buckets, hats, and t-shirts to even an umbrella. 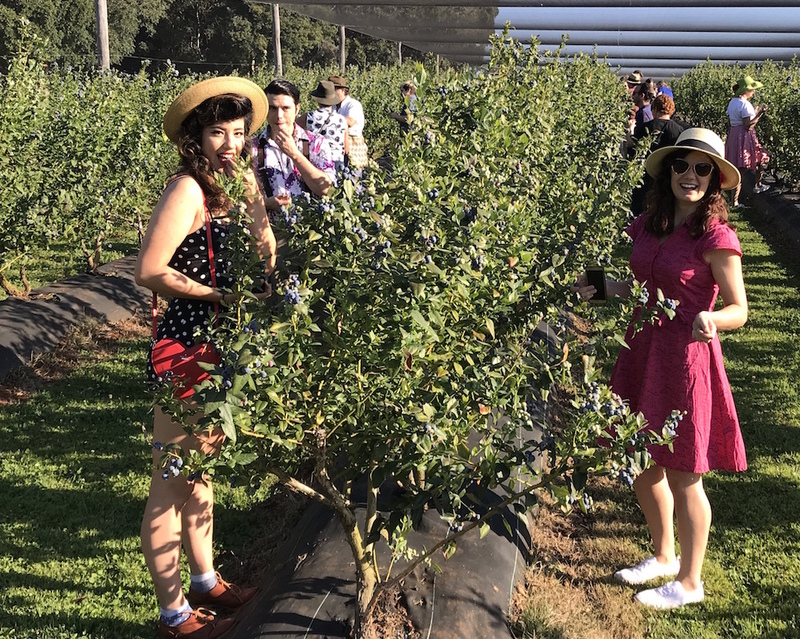 For many, it was the first time they had ever had the opportunity to pick blueberries fresh off the vine and eat them. 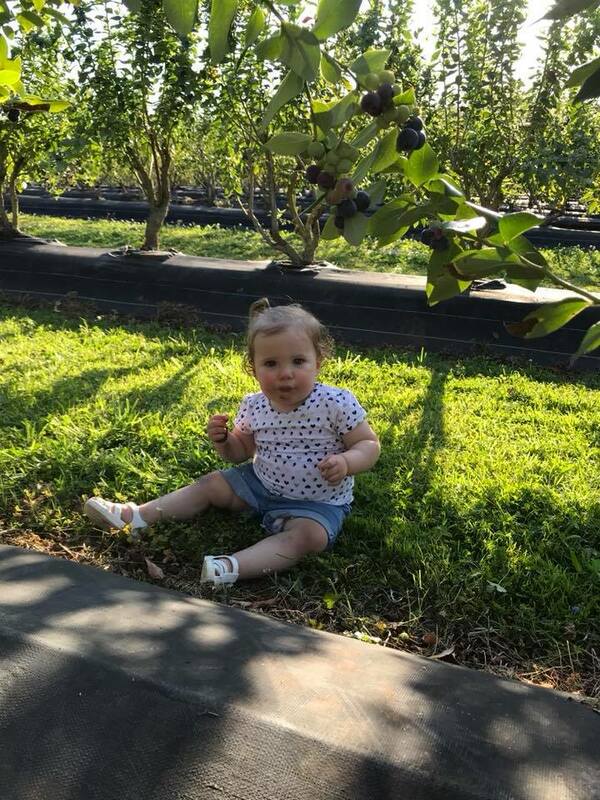 For one little tot, Zoe (Nick’s one-year-old niece) it was the first time she had ever had a blueberry. Ian will be pleased to know she is hooked. She shared the bucket with her older sister, Abbi, as the two stuffed their mouths full of berries while everyone else collected berries for the afternoon tea. The day’s events ended at the Community Hall at Meerschaum Valel, where upon arrive the smell of Vietnamese rolls and rice filled the room. The afternoon tea started, however, with cakes topped with whipped cream and the freshy picked berries. As the caterers prepared the meal, the dancing began. The music from the 20s to the 50s filled the room along with some new comers who only attended the dance. At one point the room was so full that everyone had to dance in very close, which made it even more exciting and enhanced the bonding that took place throughout the day. Lindy Hop steps along with Charleston fancy footwork were seen twirling throughout the 110-year-old hall. Of course, the night would not be complete without the Shim Sham. The tapping and movement on the beautiful timber floors added to the charm as everyone danced until well after dark. As Ian thanked the co-owners and operators of Swing On In, he brought out a chocolate cake with the words, “Thanks for the Gift of Dance Ray and Chrissy”. Overall, the day was a huge success, and everyone gratefully acknowledged all the effort and coordination required to organize such an outstanding event. More details and pictures from the day’s activities are available to view via Facebook,Instagram and YouTube using the handle @SwingOnIn. 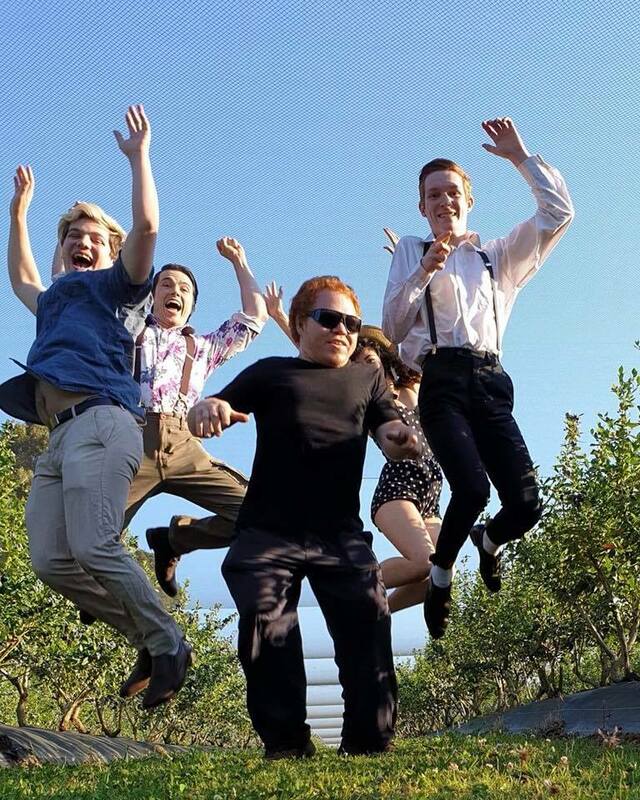 Click here to watch the slideshow and video of all the Swing in the Flowers fun. To learn more about Beauties Feeling Fabulous reach out to Chrissy at lindycharmschool@gmail.com or 0409727888. Visit the Swing On In website for information about weekly rock-n-roll, lindy hop and swing classes in Bangalow and the Gold Coast.